The Lilliput 329/DW 7" Wireless FPV Monitor is designed for aerial photography monitoring and offers up to a 1.2 mile wireless distance. It features dual 5.8 GHz receivers and automatically switches to the one that gets the better signal. The two receivers independently cover 4 bands and a total of 31 channels. The display has a resolution of 800 x 480 and brightness of 400 cd/m². A sunshade is included that will help you see clearer in sunlight. The 329/DW also comes with a VESA mount battery bracket and both F970 and LP-E6 battery plates. The bracket secures on the back of the monitor, and the battery plates can be used interchangeably by simple snap-on attachment. Batteries are sold separately. An F970 battery will provide with approximately 5 hours of operation and an LP-E6 battery about 2 hours. 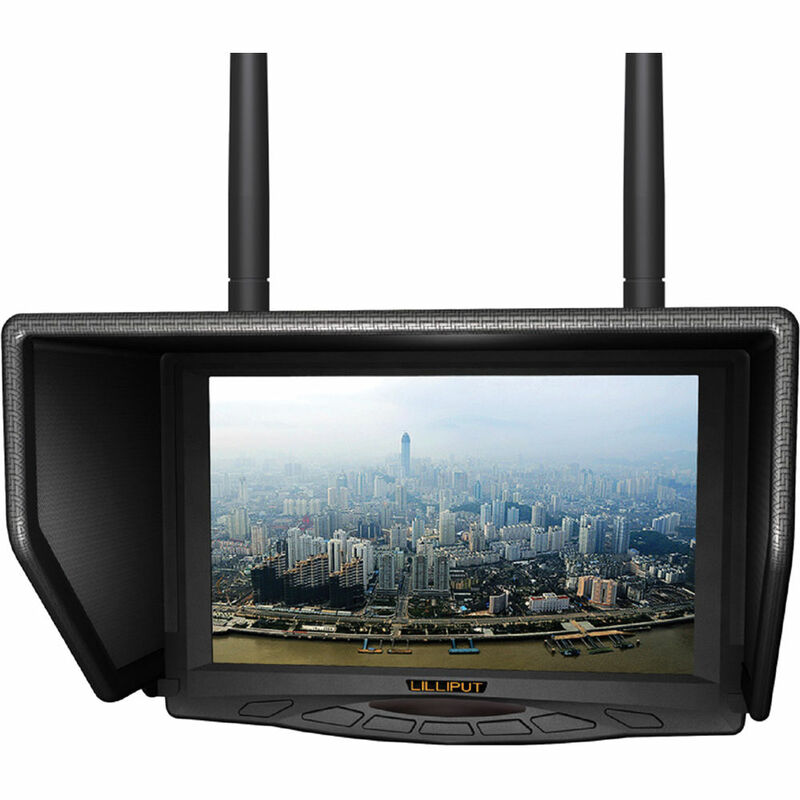 Box Dimensions (LxWxH) 10.6 x 9.2 x 2.7"
329/DW 7" Wireless FPV Monitor with Dual 5.8 GHz Receivers is rated 5.0 out of 5 by 1. Rated 5 out of 5 by Nicholas from High quality sharp screen - but it does go to blue The build quality on this screen is excellent. It has tripod mount points on every side, the ability to flip the image, and is capable of receiving a signal from an external source. The one issue I have with it is that it goes to blue when there is no signal. As anyone who uses FPV knows, this is usually a deal breaker. But the clarity of the screen and crisp sharp image make up for it. The blue screen only happens in the very worst of conditions, but it would of been best if it was not a part of it at all. I use this for controlling a ground based rover, so I don't need to worry about crashing. Will this monitor work with the Spektrum Ultra Micro FPV Camera and Video Transmitter SPMVA1100? The 329 has 31 channels that will cover some of the 7 channels. Not all channels will match up in your area with clear signal so you may need to cycle through the matching channels. Will this work with a Sony PXW-f55? No,please buy LILLIPUT A7S or A12. Will this work with the phantom 2 standard and would I need to buy anything else to make it work? Yes this will work with the Phantom 2 and 3 axis gimbal for Gopro. You will need a 5.8Ghz transmitter, Antennas, hub to rewire, a battery for the monitor and a charger for that battery. It is possible to use this monitor as an output monitor for a car head unit? Thank you for your questions . The model 329/DW comes with built in dual 5.8Ghz AV wireless receiver but not able to receive WIFI signal . thanks . Will this work with a Samsung NX1? Thank you for inquiry. The monitor doesn't come with HDMI for Samsung NX1. Are both the AV in and the AV out HDMI? Are they mini HDMI?AND, is the output 1080p? 1080i? Thank you for your inquiry. If you are looking for a 7 monitor with both HDMI and 5.8Ghz Wireless ,please buy model 339/DW,thanks.